1) Though I do agree with who knows what the future may hold, I do believe that this is a skill all kids will need. At one point in time no one knew how to read. In fact it was only geared to the clergy because they had to read the bible. Now that skill is in every classroom. We may not be there yet but I think we are very close. Coding is a part of everything that we do and our everyday. I think that it is important to know how things operate. Yes that does mean changing our oil and fixing our cars. We may not have the time but I think as adults these are important skills. Students now should learn about how their electronics work. How do we make them do what we want to do? I am not saying that all of them will become computer programers but we should understand the basics. 3) Most kids if not all, love to code. Now I say this with a side note. I do find that when the task is meaningless then some kids are not as engaged with coding but if they are creating something and the right differentiation is in place then they are all in. To be honest you can say this with most ideas but it does apply here. 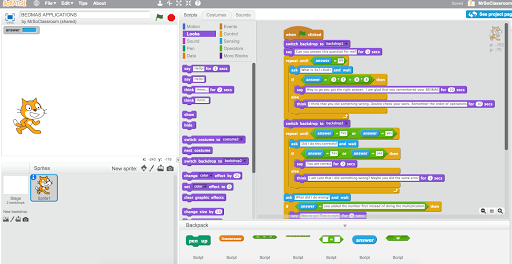 4) Coding teaches logical order and research skills. 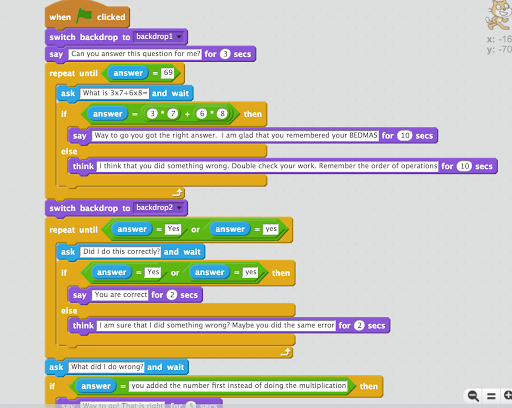 I don’t have numbers yet but the more that I have done coding the more that I have noticed my students critical thinking and sequencing skills improve. I have noticed my students improve in making connections and seeing how all the big ideas link together. Again I cannot say this is all coding but I believe that this is a major reason. For me coding fits naturally with mathematics. I mean the main idea of spatial sense is right in our curriculum. However, that is not the only area you can use it for. 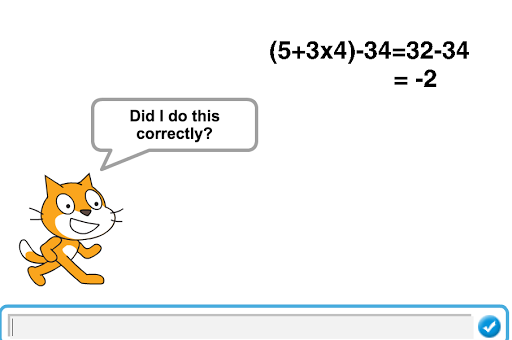 Today I thought of turning a quite boring lesson of order of operations into a coding exercise. It was really cool to see the students take a foundational lesson and a very procedural lesson and apply some creative and problem solving skills. The challenge was to create an app that can test students understanding of order of operations. Students had to also have their users think about misconceptions and possible errors. The students still need more time but here is the sample that we have been working on, link. Throughout this process the main purpose was not to teach coding but to understand the basic idea around order of operation. Sure I could have just told them the answer but they have now started to work through the procedure and how students can make mistakes. I hope that when we debrief they will forever have an understanding of order of operation. 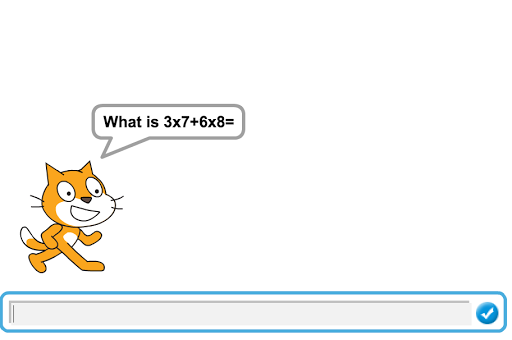 This is just one example of how coding can fit into our everyday math lessons. The main focus should always be the concept and idea of math and then the tool. By teaching this way I have allowed my students to explore order of operation and to critically think about the concept.